It always amazes me what sparks us into action. Sometimes it’s the smallest little thing that convinces us it’s time for a change and that pretty much sums up my recent decision to replace my chainsaw. The one I have has served me well, but I wanted something with a little more power. In the past I would have just taken a trip down to the local hardware store, perused the aisles, and made a spur-of-the-moment decision based on a cursory examination of the little blurbs on the packaging. This time I was determined to take a slightly more scientific approach to the buying process and so I set out to do some real research into chainsaws. It turns out there’s a lot to choose from and it soon dawned on me that there were other people out there that would benefit from the research I had done. The reviews and information articles you’ll find on this site are the product of my own search for a new chainsaw. You’ll find reviews of gasoline-powered chainsaws, electric chainsaws, and some battery-powered ones as well. There are even a couple of reviews of some innovative chainsaw products you’ve probably never seen before. In the informational articles I’ve tried to include valuable tools you can use to better understand how chainsaws work and how to operate them safely. How you use this site is really up to you. It isn’t like reading a book. You don’t have to read the pages in any particular order, and how much of the content you take advantage of is up to you. Perhaps you’ll want to stop by a few times, or maybe you plan on binge reading all of the site’s content in one session. This site is designed to be used as an information tool to make your buying decision easier; how you arrive at your choice is in your control. We review a lot of chainsaws on this site and if it seems a little bit overwhelming you might be happy to know we’ve also included our top 8 picks right here on the home page. If you’re in a bit of a rush these brief overviews of our favorites are a great place to start. The full reviews are a lot more detailed of course, but these will give you a good idea of what you’ll find in those reviews. If none of these seem to be what you’re looking for then by all means take a look at some of the other reviews – there’s bound to be something here that will suit your needs. 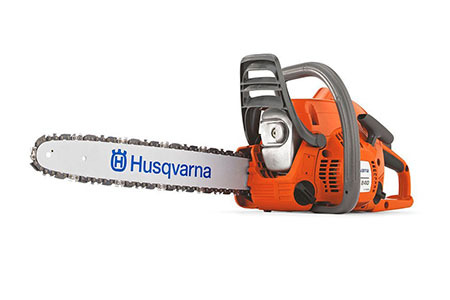 If you’re looking for a machine with the most raw power available there really is no substitute for a gas-powered chainsaw, and one of the best is the Husqvarna 460 Rancher. This machine boasts a 24-inch blade and a 60cc engine – there isn’t a lot you can’t cut with this thing. It will make short work of any project in your backyard but it’s also more than capable of holding its own in an industrial setting. This is the type of chainsaw you need when you’re dealing with a difficult cutting job that needs that extra torque to ramp up the RPM’s. Safety hasn’t been forgotten of course. It’s equipped with an inertia-activated chain brake that immediately recognizes when the machine kicks back and shuts it right down. A loose chain can also pose a safety risk, and that’s why the Rancher has a built-in chain tensioner that you can easily access – without the need to reach for any tools. This is a powerful machine so you still have to be conscious of the potential for danger when operating it, but it’s comforting to know there are a lot of built-in safeguards to protect you. 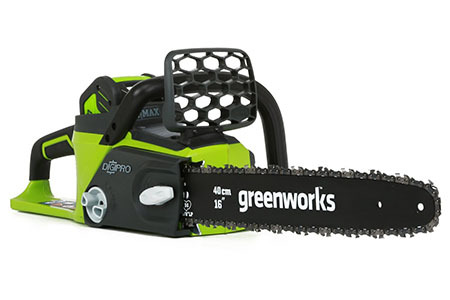 We’ve included a few battery-powered chainsaws and chainsaw alternatives in our best-of list, but if there’s one that stands out for me it’s the GreenWorks 20312 G-Max. This machine is a cordless and environmentally-friendly chainsaw, but it’s also equipped with a 16-inch blade – most electric or battery-powered chainsaws are limited to a 14-inch blade. That extra 2 inches gives this machine a real advantage and it produces absolutely no emissions either. It turns out you don’t have to sacrifice cutting capabilities to find a truly green alternative. It’s a pretty powerful machine with a 40 Volt battery and a brushless motor that makes it operate up to 30 % more efficiently than other comparable products. The fact that it doesn’t have an internal combustion engine means it’s a lot lighter than gasoline-powered models and it starts at a push of a button. 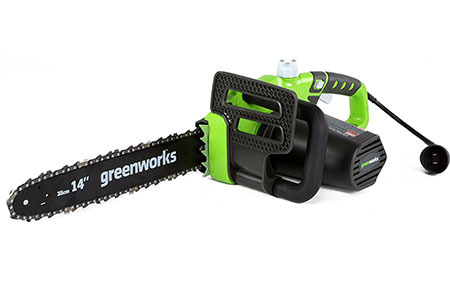 If going green is your thing this may be the perfect chainsaw for you. Battery-powered chainsaws aren’t the only zero emission options on the market, electric models are also a great option if you’re worried about your environmental footprint. The GreenWorks 20222 is our top choice in the electric chainsaw category and it’s a pretty crowded marketplace. With a 14-inch blade it isn’t meant to be used as an industrial saw, but it’s perfect for a cleanup job in your grandparent’s backyard. It also has an easy electric start that simply starts with the push of a button – no need to yank on a cord. Aside from the green nature of this chainsaw, I was also impressed with its numerous safety features. It’s equipped with a comfortable wraparound handle with a debris guard that blocks wood chips from bombarding your hands. It’s also equipped with an automatic chain oiler which keeps the chainsaw operating smoothly and helps to prevent any unexpected jerking motions. If it weren’t for the fact that you have to put up with dragging an electric cord behind you there really wouldn’t be anything negative to say about this chainsaw. I think a lot of people expect to have to open their wallets pretty wide when purchasing something like a chainsaw, but there are some affordable options available. 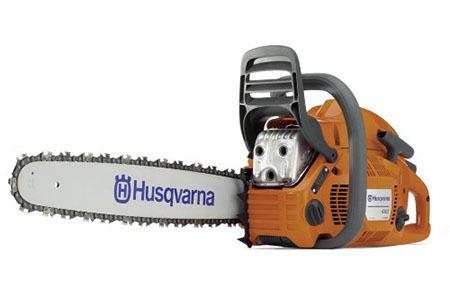 Our best choice for a chainsaw priced under $250 is the Husqvarna 240 2 HP. This little machine gives you the power of a gas-powered chainsaw at a price that’s a lot more palatable than most. It’s equipped with a decent-length blade at 16 inches, and it has the horsepower to cut through small to medium sized branches. This model may be less expensive when compared with other chainsaws, but it hasn’t sacrificed any of the features that are common on chainsaws these days. It’s designed to automatically shut down if it comes in contact with a knot that causes it to jam, to prevent injuries from kickback. It also has an easy access adjustment knob that lets you make quick adjustments to the chain tension as you work, without digging out the toolbox. It’s quite a capable machine for the price. We all have our own personal biases when it comes to just about anything, and with respect to all of the chainsaws that we review on this site the Echo CS-590 is easily one of my favorites. This chainsaw is a well-oiled machine that will power through just about any cutting job you put in front of it. Its 20-inch blade isn’t the longest you’ll come across, but it will get the job done. What you get with this model is reliability. It starts almost every time on the first pull and it has an extended 5-year warranty that far exceeds the industry average, and at a price just over $450 it isn’t extremely expensive. Another key feature is the built-in anti-vibe technology that will make the cutting process a lot more comfortable. It has a nice ergonomic handle design as well. It has all of the standard chainsaw features that most consumers expect these days, such as an automatic chain oiler – it really is a great machine. In a world that becomes ever more environmentally conscious with each passing day it seems appropriate to include another battery powered chainsaw. 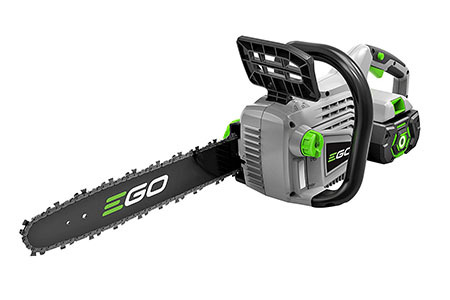 The EGO Power+ 14 inch chainsaw is a capable chainsaw that’s ideal for the average homeowner. 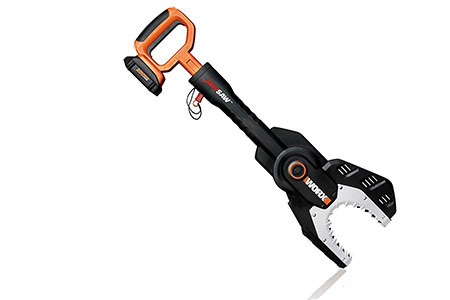 It features a 56-volt battery that will give you enough power to easily cut through most small to medium-sized branches and you should have no problem completing your pruning and trimming jobs on one charge. While the 14-inch blade on this chainsaw isn’t the longest one on the market, it’s long enough to handle most backyard cutting jobs. The shorter blade also makes it easier to wield, so if you have any difficulties working with heavy power tools this is a great option. It’s also equipped with several built-in safety features such as a kickback brake which will protect you from potential injuries. 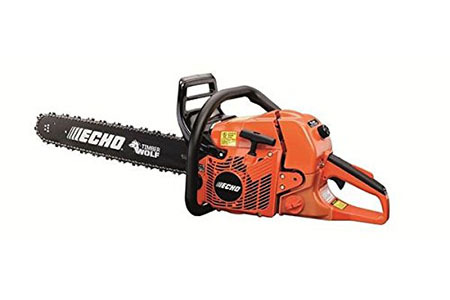 It’s a great choice for a battery-powered chainsaw. Believe it or not, there are some interesting and innovative products in the chainsaw market and one of my favorites is the pole saw. If you’ve never seen one, essentially it’s a chainsaw on the end of a pole which extends its reach considerably. In this category the Black+Decker LPP120 is a great choice. As an added bonus it also happens to be powered by a lithium ion battery so you can do your part for the environment while you work. With this saw you can extend your reach up to 14 feet, which means you don’t need to pull out the ladder when it’s time to cut those higher branches. The blade isn’t very long at 8 inches, but that’s by design because when you’re placing a chainsaw on the end of a pole you have to minimize the size and weight to make it manageable. It’s really a tool that’s meant for trimming and if that’s what you’re using it for it’s the perfect tool for the job. Its battery is long lasting so you should be able to perform up to 100 cuts on one charge, which is perfect for backyard work. To top it all off you don’t have to drag around a cord and you don’t have to make sure the gas can is full – you simply have to charge it when it’s not being used. Another great option in the chainsaw category is something called a jaw saw. 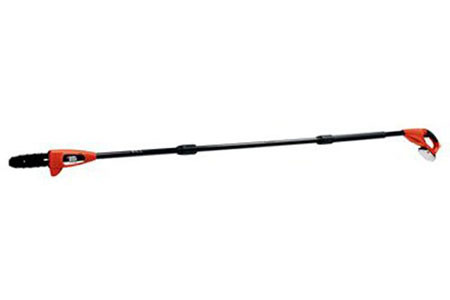 Our best pick for a jaw saw is the Worx WG320. This is another lithium ion battery-powered tool and its unique design takes safety to another level. Instead of a typical blade with a chain wrapped around it, it features a pair of jaws with chains on either side. To make a cut, you close the jaw in a scissor-like motion and it closes on the piece of wood from either side. It’s a much safer design than a typical chainsaw, as you are never exposed to the chain that is completely enclosed by the jaw. It’s not meant for larger cutting jobs, but it’s ideal for pruning and trimming. This jaw saw comes equipped with many of the standard features you’ll find on other chainsaws, including an automatic chain tensioner and an automatic oiler. It’s also equipped with the ideal protection against kickback as the jaw-style design virtually eliminates that possibility all together. It’s a unique tool that’s perfect for your simple clean-up duties. I’ve always been a fan of a sneak preview – I was that kid that was always trying to work an angle to find out what was under the Christmas tree for me. That’s why I couldn’t resist giving you a preview of what to expect in the information articles you’ll find on this site. You will find a more comprehensive buying guide inside, but in the next few paragraphs we’ll give you a quick overview of what to look for when buying a chainsaw. Before you even consider purchasing a chainsaw you should place safety at the forefront of your mind, and that begins with the proper personal protective equipment. There are quite a few items you should outfit yourself with when operating a chainsaw, including a safety helmet with shield, chainsaw chaps, and chainsaw gloves. 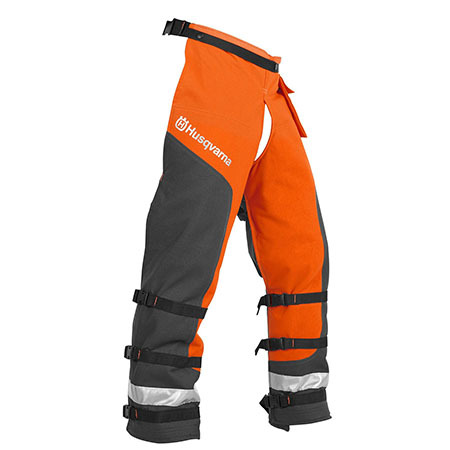 Chainsaw chaps and gloves are not made from conventional materials. In fact, they normally include Kevlar – the same substance bulletproof vests are made from. Before purchasing these items, make sure they include this material or something very similar. A pair of goggles underneath your helmet’s shield is also a good idea as it completely encloses your eyes, protecting them from flying debris. Chainsaw helmets are must-have safety items for anyone operating a chainsaw. 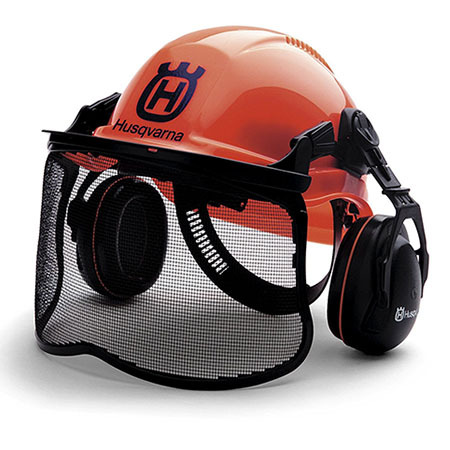 The best rated chainsaw safety helmets are all reviewed right here. 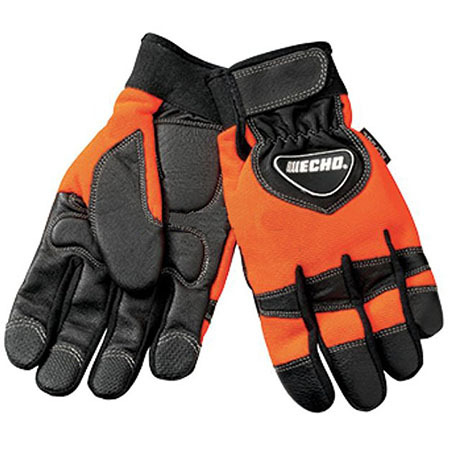 Make sure that you wear all of the proper personal protective equipment while you work, and this including cut-resistant chainsaw gloves. How Long Should Your Blade Be? The length of the blade on a chainsaw is one of its most important features. Let’s just say you wouldn’t want to try to cut down an old growth oak tree with a 14-inch blade. This length of blade is fine for working in your backyard, but it’s not the saw for you if you’re using it for a tree cutting business. Fortunately, there are a lot of different options available. The type of projects you plan on using the chainsaw for will determine how long your blade’s length needs to be. They range in size from about 8 inches all the way up to 3 feet for industrial strength chainsaws that are designed for use in commercial logging. On this site we look at many different types of chainsaws and they’re powered by a variety of different means. If you’re looking for pure power there’s still no substitute for a gasoline-powered chainsaw; most modern chainsaws do meet minimum environmental standards, but they will always give off some emissions. If using a gas-guzzling chainsaw is simply not on the table for you, a battery or electric-powered saw is the way to go. Both of these types of saws produce zero emissions and have certain advantages. An electric chainsaw only needs an available outlet and a cord and you’ll never have to refuel. A battery-powered chainsaw is even more convenient, but you will be limited in how much you can use it between each charge. We’ve talked about the necessary safety clothing you need before operating a saw, but that’s not all you need to know about safety. Modern chainsaws are equipped with many built-in safety features that are designed to protect the operator from potentially serious injuries. These include kickback guards, chain brakes, a throttle lock, and a chain catcher. All of these items are pieces of the puzzle in making a chainsaw as safe as possible to operate. If you’re going to be a safe chainsaw operator, it’s important to understand what each one of these features do and how they protect you. Safety features aren’t the only things you’ll want to consider when purchasing a chainsaw. These tools are equipped with many different items that make your life a little easier. I’m referring to things such as automatic oilers and tool-less chain adjustment features. Many chainsaws also include designs that make your chainsaw start more reliably, such as primer bulbs. The chainsaws we review on this site include most of these features, depending on whether they’re gas-powered or not, and that’s why we believe they’re some of the best options available. Another important thing to consider when purchasing a chainsaw is your own personal comfort and how to avoid wear and tear on your body. Most chainsaws have some sort of anti-vibe technology built-in, but you should also consider the weight of the machine you’re purchasing, as this will affect the strain on your body as well. Ideally you want a light weight, powerful machine, with added comfort features such as padded handles. Finally, remember there are alternatives to traditional chainsaws. If you don’t like using ladders for safety reasons you may want to consider a pole saw, which can extend your reach by several feet, allowing you to reach higher up branches without a ladder. The jaw saw is another great chainsaw alternative that cuts nice and evenly and reduces the potential for injury. These alternative saws are not normally as powerful as traditional chainsaws, but they’re great for the typical homeowner working in the backyard. A chainsaw can certainly make your life a lot simpler and this site is intended to help make it easier to find the right one for your needs. Our ultimate hope is that the reviews and information articles you find here will guide you in your purchase decision so that you have all of the information you need to make a good decision.